A major men’s grooming brand is seeking outgoing brand ambassadors with knowledge and interest in skincare, grooming and beauty products to demonstrate amazing product lines at a well known retailer. 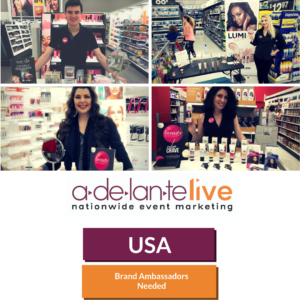 Brand ambassador with an energetic spirit and professional and helpful demeanor. Confident in discussing beauty products and passionate about skincare, grooming, beauty and hair care products. Should be comfortable with multiple message points and working in a fast paced environment. Comfortable with retention of product benefits and messaging and translating information to consumers. Have neatly applied makeup (if applicable) and neatly styled hair. No facial piercings or visible tattoos. BE PRESENTABLE AND PERSONABLE. Talent must have working cell phone, internet access and digital camera or cell phone camera to bring to event.